Caleb Carlson is currently a University of Illinois sophomore, after serving for four years in the Army. The Center for Wounded Veterans in Higher Education has helped him respond to the challenges of college – particularly in asking for help when he needs it. When Caleb Carlson began college at the University of Illinois, he was still on active duty with the U.S. Army. He was discharged about two months after the fall semester began. After four years in the Army, Carlson began his freshman year in fall 2015. The transition to college was a challenge – particularly asking for help. In the Army, he was given a problem and he had the skills to figure out how to solve it. “I was a leader. I was supposed to have all the answers for the enlisted guys, and I did. I knew my stuff,” said Carlson, who was an Army infantryman with sniper training. He was deployed twice to Afghanistan, first in a combat position providing security in Khost province, then as team leader of a reserve force that provided security at Bagram Airfield. One of the things that helped Carlson adjust to civilian life was a Veteran’s Transitions and Leadership class offered by the U. of I.’s Center for Wounded Veterans in Higher Education. The class is designed for veterans who are freshmen and transfer students to learn about assistive resources, gain practical skills that will support their transition to campus, reflect on their service history and develop a community with other veterans. “It was the most useful tool in moving from the military to here, especially since I was straddling the roles of Sgt. Carlson and student Caleb,” he said. The Center for Wounded Veterans in Higher Education opened on the U. of I. campus in fall 2015 – the same time Carlson was starting college. The center provides services to wounded student veterans that include academic tutoring, help navigating benefits programs for veterans, peer mentoring by other student veterans to help with the adjustment to campus life, rehabilitation services for veterans with disabilities, neuropsychological testing, counseling and career planning. It also has living space for student veterans with a range of invisible and visible injuries, including assistive support for those with severe disabilities. More than that, though, it’s a place for student veterans to find peers who have been through similar experiences and can relate to the challenges of college for students who are older and have far different life experiences than most undergraduates. “It’s nice to have people who understand the context of where I’m coming from. I don’t have to spend a quarter of the time translating for them,” said Carlson, who meets weekly with a clinical psychologist to talk about the anxiety he sometimes feels in moving to civilian life. Nicholas Osborne, the center’s director and a U.S. Coast Guard veteran, said the center is unique in providing a variety of services for student veterans with disabilities in one place and a staff knowledgeable about the military. “There are a lot of national models that don’t incorporate disabilities,” Osborne said. “They give referrals. The offices don’t talk with one another. They have no experience in working with military populations. There are about 350 veterans on the U. of I. campus, as well as 160 dependents of veterans. The state of Illinois has the seventh-highest number of service members with a disability, Osborne said. The center exclusively serves veterans with disabilities, which range from physical disabilities to difficulties adjusting to civilian life and to college. 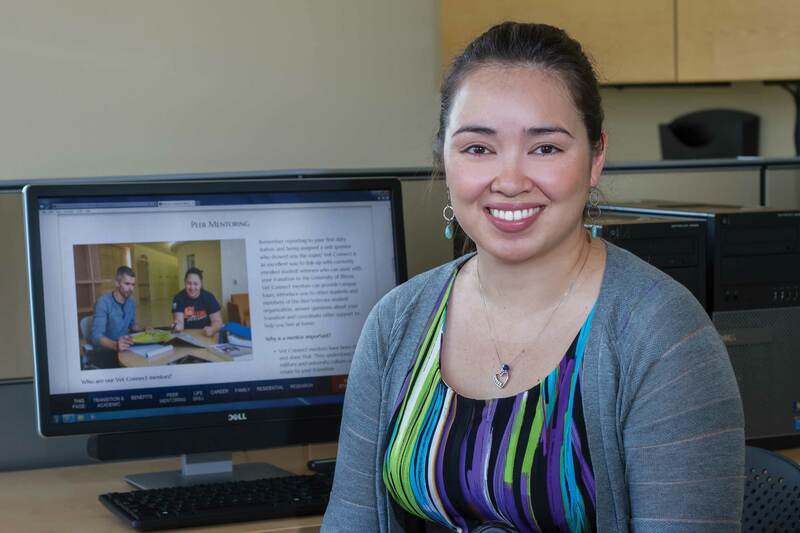 During its first year, the center served 70 student veterans, half of whom used the center’s counseling and psychological services or transitional services. Core service staff include an academic services coordinator, career services coordinator and a clinical psychologist who serves as an access specialist. Additional supplemental support is provided by the Department of Veterans Affairs, including psychological support, rehabilitation services and benefits counseling. This fall, the center will also have on site a speech therapist and a physical therapist. Among the issues the staff at the center see in the veterans they work with are academic readiness, as many have not been in school for several years; the feeling of a lack of a mission outside military life, particularly among veterans who planned to make the military their career and weren’t able to do so because of an injury; and the struggle to convey the value of their military experience to a nonmilitary employer. Student veterans are more likely to live off campus and have families and jobs, and are less inclined to participate in the activities that traditional students do, Osborne said. “(The center) is a great place for them to have a community,” he said. But, he noted, that doesn’t mean he wants them to restrict themselves to only interacting with other veterans. Patricia Starks – a U.S. Air Force veteran and a member of the Air National Guard – is the career services coordinator and social media strategist at the Center for Wounded Veterans in Higher Education. She teaches career-building techniques such as resume building and interviewing skills, helps students find internships and organizes a job workshop. She wants to help other veterans transition to college and avoid the struggles she faced. Patricia Starks is an Air Force veteran and a member of the Air National Guard. Starks joined the Air Force after high school and spent three years on active duty in Tampa, Florida, and Virginia Beach, Virginia. She was deployed for six months in Iraq, doing communication support. She found a sense of purpose being part of a team. She also found her calling: working in mental health services. Starks enrolled at the University of Illinois, studying psychology. But the transition to college was much more difficult than she thought it would be. “I was coming from a very structured environment where everyone was on the same page. The freedom of opportunity was very hard for me,” she said. She was isolated and failing academically. When the chance for another deployment opened up, she jumped at it, “escaping” to a second six-month deployment, this one to Afghanistan. Starks felt defeated by college but decided to try again. She came back to the U. of I., reaching out to the Illini Veterans student group and Osborne, who was at that time working with student veterans through the student affairs office. “There was a community I felt comfortable with, a community that understood the struggles of the majority of student veterans – how to contribute, how to find a purpose,” Starks said. She became involved with Illini Veterans and she’s now the president of the student organization. She finished her bachelor’s degree in psychology in 2015, and she’s now working toward a master’s degree in social work. She’ll do an internship with the Veterans Affairs center in Danville, Illinois, this fall. Starks is again part of a team. 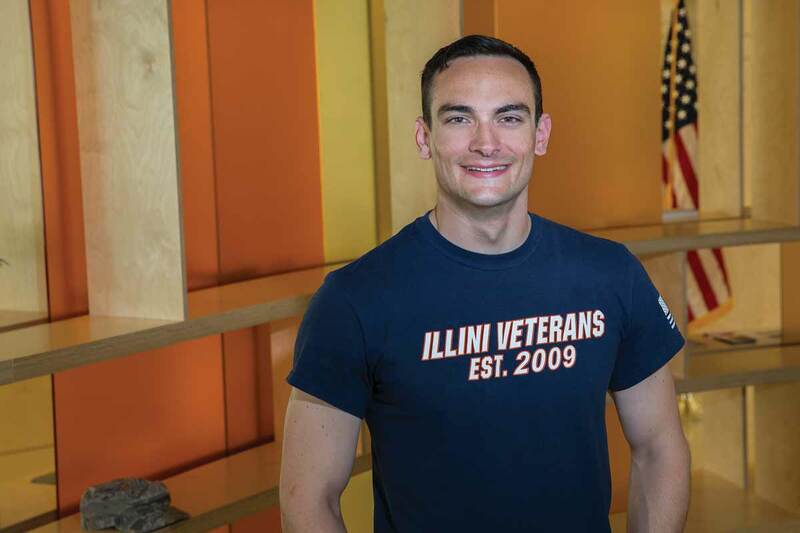 Starks is proud that the center has given student veterans a voice with the U. of I. administration and helps administrators understand the needs of military veterans. Osborne agreed: “We’ve been very successful at helping deconstruct the stigma around being a student with a disability. Editor’s note: More information about the Center for Wounded Veterans in Higher Education is available online at woundedvetcenter.ahs.illinois.edu/.